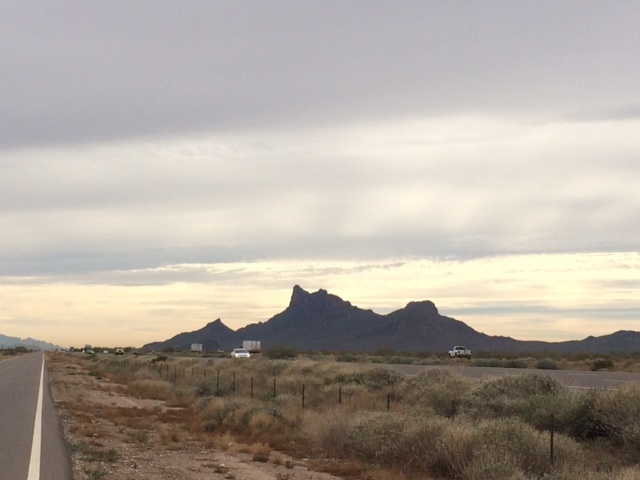 Trip Log – Day 201 – Casa Grande, AZ to Tucson, AZ | How Will We Live Tomorrow? A chilly, grey morning lingered into a chilly grey day. 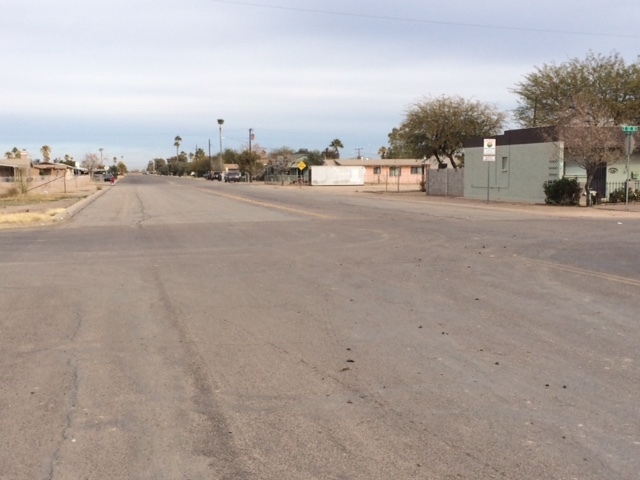 Twelve miles on I came to Eloy, a desolate place with a near-empty Main Street. All the action was at Food Town, where bakers and stockers and cashiers all chatted with the customers. Despite having a full breakfast, I tanked up on mango yogurt, a banana and a pair of Mexican Sweetbreads. I could add a bumper sticker to my bike: I stop for Panaderia. Outside of town I connected with the I-10 frontage road. Despite traffic whizzing past 100 yards away, the road was my solitary space, a straight and steady rise with the wind in my face for 32 miles. This situation connects me with the Zen, the yoga of cycling. For the first few miles I push against the reality that for the next few hours I have nothing to do but pedal. I shift in my saddle and check my odometer’s every click. My mind calculates and recalculates. How far have I gone? When will I get to the Exit 244? I invent games to pass the time. At some point the mental gymnastics dissipate. I resign myself to pedaling. Nothing changes. The mountain in the distance remains fixed and unattainable. The landscape is too big to register my slow progress. The wind is too steady for me to feel its variation. The grade is too slight to discern any rise or fall. Finally, out of that space where nothing changes, I stop thinking about time or progress. Everything becomes hyper alive; the smallest wind shift, the shallowest pavement dip. The immovable distance I must cross vanishes. The struggle of time passing evaporates. I simply breathe where I am. Long stretches are perfect for singing. My repertoire is triggered by whatever passes; a car, a sign, a bird. I come to Red Rock, which is nothing more than a stretch of railroad and rudimentary interchange. Immediately I recall Song for Martin by Judy Collins. It begins, “In Red Rock Arizona he lived for many years alone…” It’s been twenty years or more since I sang the fragile poem of a not-quite friend’s suicide. But lyrics stick to memory like oatmeal to our gut; I remembered every line. The song resonates even more haunting rolling across this blank expanse where so many years ago someone Judy wished she knew better took his final breath. The wind, the slope, the landscape, and my mood all turn around in Marana, Tucson’s northwestern exurb. My steady climb becomes a gentle decline. The wind shifts from my head to my tail. The frontage road is littered with offbeat stores and construction yards. My spirits lighten as I approach my destination. 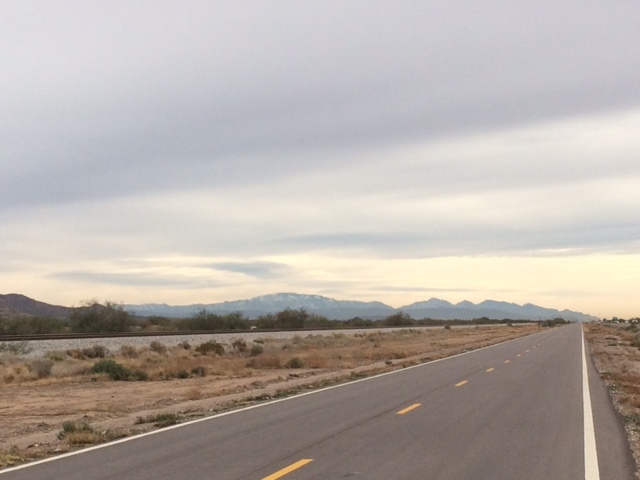 At Twin Peaks Road I shift to the The Loop, Tucson’s extensive bicycle ring path. I’m released from the Interstate’s throb. 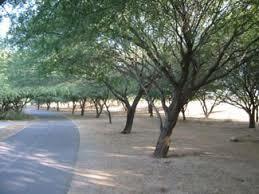 I ride a wide paved path lined with Ironweed and Mesquite, scrub cactus and sharp rock until I reach my destination. 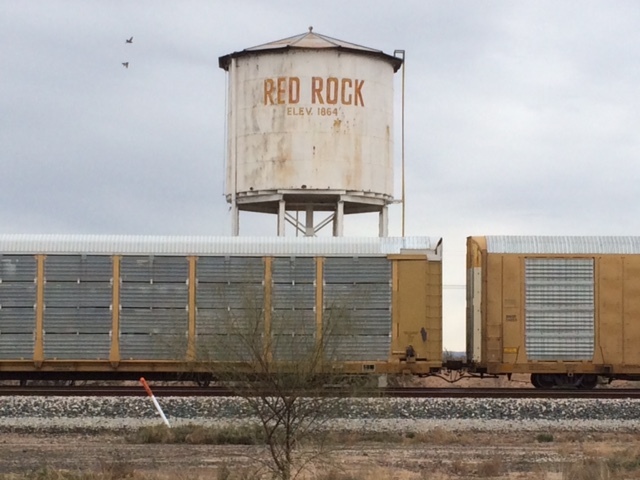 This entry was posted in Bicycle Trip Log and tagged Eloy AZ, Judy Collins, Marana AZ, Red Rock AZ, Santa Cruz River, Song for Martin, The Loop Bike Trail, Tucson AZ, Zen of cycling. Bookmark the permalink. 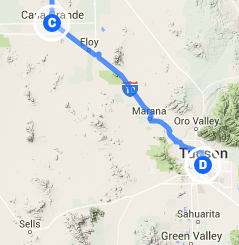 You tell a good story about your solitary ride from Casa Grande to Tucson. Thank you for reconnecting me to this location and to the voice of Judy Collins who also tells tender stories. Enjoy the Zen of cycling and thanks for reminding me of how pedaling can steady my day.